Want to upgrade to the latest and greatest iPhone? Assuming you qualify for a new contract, the price of the iPhone 4S is the same on all carriers, starting at $199 for the 16GB version. If you don’t qualify for a new contract, there’s a wide variation of potential prices and fees that will come into play when you upgrade, so here’s how to check your exact eligibility status and the costs associated with it for each US carrier. First things first, Apple’s upgrade checker website works with AT&T and Verizon, and Sprint will be added soon. You will get more data and sometimes a different offer if you check directly through your carrier though, so it’s recommended to do both. AT&T users call *639# from the phone or plan they want to upgrade and then wait for a text message from AT&T. 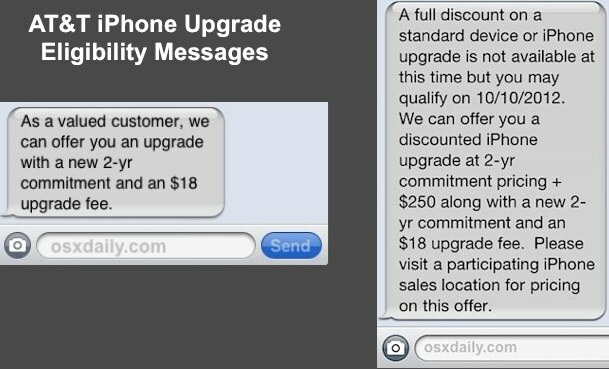 Currently most users will get one of two messages, one saying they can upgrade to the iPhone 4S with just a new two-year contract plus a $18 fee, and others are given a date of when they’ll be eligible for that same offer. For the latter, if you’ve had a plan for at least 6 months it seems like AT&T will readily offer an iPhone 4S upgrade for the price of a $250, plus an $18 fee, plus the signing of a new contract. This seems to vary widely based on your existing plan and contract, as we’ve discussed AT&T upgrade eligibility before, and for upgrading earlier in your contract they want you to visit a local AT&T store to obtain the offer. Verizon users can dial #874 on their existing phones to discover their upgrade eligibility status, or they can login to their Verizon account online and check their existing plan that way. You don’t need to be an existing iPhone customer to check for the upgrade, so if you’re ready to switch from an Android you can do that, but you will need to sign a new two year contract and pay an upgrade fee. These costs vary on your plan and your existing contract, so it’s best to check directly. Sprint is the newcomer to the iPhone party, and if you’re an existing Sprint user you just need to visit their upgrade page to check if you can upgrade and the fees and costs associated with it. The huge advantage to Sprint is they offer unlimited data plans, the only remaining carrier in the USA to do so for iPhone users. According to mixed reports on the web, there are a few instances where it may actually be cheaper to switch carriers and end an existing contract then to upgrade directly on the same carrier. This is appealing if you’re looking to jump to the unlimited data plans offered by Sprint, get faster 3G speeds on AT&T, or get reliable calls on Verizon. Each carrier has it’s own strengths and weaknesses, but that’s up to you to figure out. Finally, pre-orders for iPhone 4S start on October 7 on all carriers, and the public release day is October 14. I’m just stunned at how dumb AT&T is being about this. The contract breakage fee, even for someone who just got an iPhone 4 last month, is $175. For anyone who has had it longer that diminishes by $5 per completed billing month. So AT&T is telling me, an early iPhone 4 adopter, that my choices are to pay $100 over base price and go to Verizon or pay $250 to commit to a new 2 year contract with them? Even IF the quality of service I was getting from AT&T wasn’t poor that would be a pretty easy choice. AT&T’s ETF for smartphones (which went into effect shortly before the introduction of the iPhone 4 last year) is $325 – $10/month. I’m getting this message too, AT&T must have just changed their upgrade path because before I could upgrade for much less. Sprint is very appealing with the unlimited data, I am considering just ending my contract early and paying the penalty because then you can sell the iPhone 4 for about $300 anyway and recoup that cost. After I have my AT&T iPhone4s for 2 years… then what happens? Can that same phone be switched to 1 month of Verizon? Then switched again to 1 month of Sprint?